SPECIAL T-TOP OFFER: Order any Stryker T-Top today, and your ENTIRE order ships free via UPS Ground. That could save you $125 to over $250! 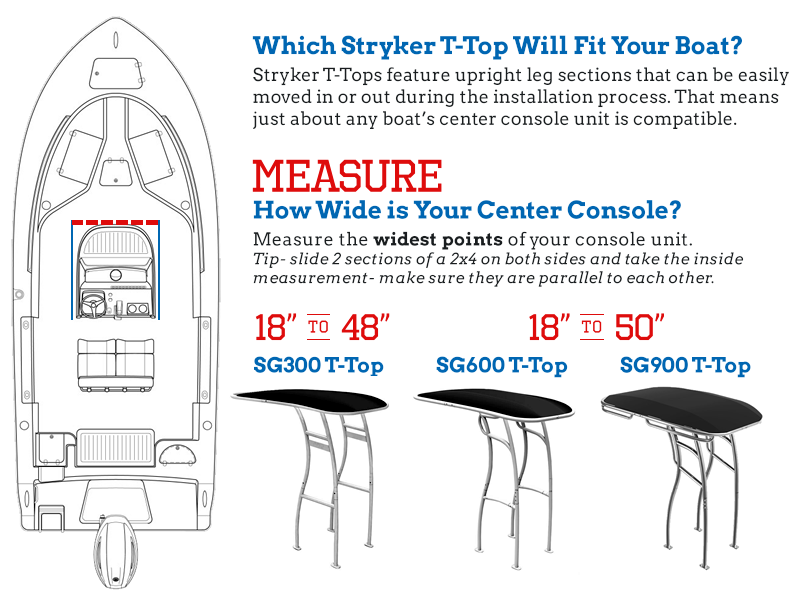 The Stryker SG300 T-Top for center console boats is designed with the same custom style and rugged construction as Stryker's best selling folding T-top the SG600. Both models are designed to go toe-to-toe with any aftermarket, custom fabricated or OEM factory made t-top. Our t-tops are "universal" meaning the upright leg sections can be moved in or out to snugly fit the dimensions of your center console unit. Completing the install with the massive solid aluminum top clamps and included side supporting stand offs, you will have a rock solid, beefy t-top structure with no sway, wiggle or rattle. 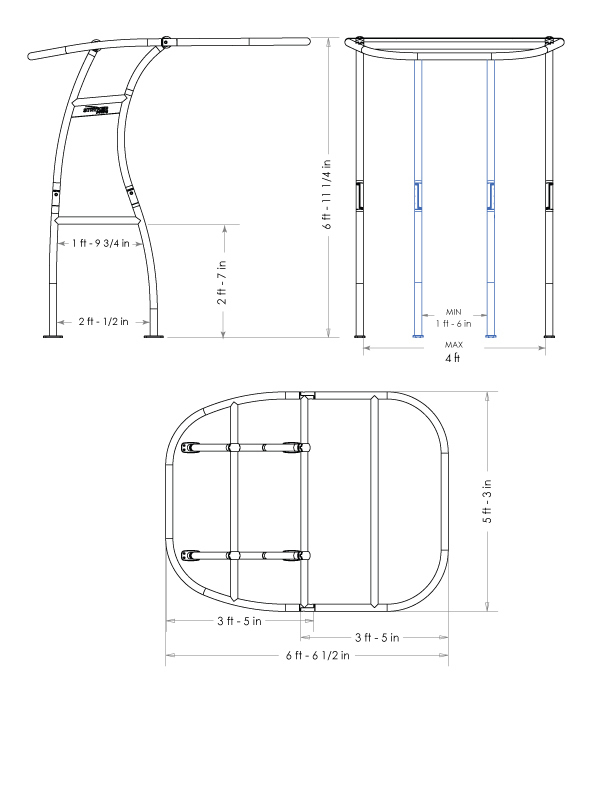 All our t-tops are made of premium 2 inch diameter (not 1.9" or 1.5" like some competitors) 6061-T6 high tensile aircraft grade aluminum (not weaker 6063 aluminum like some competitors) with a high performance marine-grade anodized finish (full anodizing bath on completed sections after they are fabricated and welded unlike some competitors) to seal everything with the best protection against corrosion and to withstand the harshest environments. Capable of supporting hundreds of pounds, the SG300 offers the same durability and strength of custom and OEM-installed tops but at a fraction of the cost. The SG300 does not include welded mounting plates or a folding top section but the Stryker SG600 T-Top does. Marine grade 316 stainless steel fasteners and pre-fabricated, pre-welded sections with solid joints make the SG300 T-Top one of the stiffest and strongest universal T-Tops available. The T-Top is compatible with virtually every center console boat made in the past 50 years, and will fit over most any console unit up to 48" wide. The SG300 T-Top is backed by a 5 year warranty for workmanship. When it comes to comparing our t-tops to the other aftermarket ones, it's no contest- Stryker is the king of the seas when it comes to strength, material, style, construction, welding, performance, longevity, warranty, fit and finish. Plus, we have an execllent full time sales and support team available by phone, email and live chat. Make the right investment with your time and money and do it all right the first time with Stryker T-Tops and accessories. The Stryker is designed for quick assembly and installation without compromising durability. The top is packaged in two conveniently sized cartons for fast shipping via UPS. A professionally filmed 25 minute online video provides detailed step-by-step assembly so you can follow along plus, we have detailed installation manuals. Plus, our fully staffed sales and support team are just a phone call away if you have questions. All that's needed are some basic household tools and a helping hand. Well over 90% of our customers have installed theirs themselves with an average of 3-5 hours all in. You too can dramatically upgrade your boat with a strong and stylish t-top, get a wide area of much needed shade to extend your days fishing, add tons of room for handy accessories, and increase the value of your boat with a small investment in a Stryker T-Top. Like every single one of our other happy Stryker T-Top customers, you won't believe the quality and performance and you wish you would have done it sooner! Overall Height: 6' - 11 17/64"
Overall Top Width: 5' - 3"
Wow!!!! Where do I begin. The SG 300 T-top exceeded my expectation in every way. Easy to install, well made and looks great. The reactions and compliments from my boating friends and non-boating friends have all been over the top positive. My offshore friends cannot believe it was an aftermarket installation. Keep up the great work Stryker!!!!!!! Shopped all Around and could not get a better deal than what STRYKER had to offer, Great Shade for sizzling Hot summer days, Great Craftsmanship better than most custom T-tops. premium 2” diameter T6 6061 high-tensile, thick and rugged aluminum tubing with a super protective marine-grade full bath anodized finish to withstand many years of harsh punishment. Floor mount for Sturdy Durability. My family loves this T-top!! We had a bimini top with the boat when we bought it and it would always get in the way when we were fishing. This T-top is so solid and was easy to install. I get comments on it all the time. It really finishes the boat off and makes it very functional. The rocket launchers on the back are amazing and the electronics box is perfect. Stryker even cut me a discount for being a veteran! Great service and amazing product! Thanks Stryker! Awesome well built - fits and looks great! This is the best T Top I've installed on a boat ever... Really elevates a custom boat to a whole new level!! I couldn't be more pleased with the look and functionality of my Stryker Top. The electronics box is real handy and dry as a bone. Thks. Guys ! Absolutely love my Stryker T-top. Very easy to install and excellent quality. There was a delay in shipping so Stryker even offered to upgrade my storage box. Completely happy with my purchase and it makes the boat look so much better.